Founded in 1891 as the Scottish Orchestra in Edinburgh, the Royal Scottish National Orchestra added the word “National” in 1951 and in 1977, when Queen Elizabeth II became its patron, the word “Royal” took precedence as its prefix. Over the years great conductors have led the orchestra: Sir John Barbirolli, Walter Susskind and George Szell to name three. Its principal conductor from 1959 to 1984 was Sir Alexander Gibson, who also conducted the Royal Ballet pit orchestra at the same time. Eighty-five players strong, the RSNO gave two concerts at the Kravis Center on March 14 and 15 under the leadership of Peter Oundjian, conductor of the Toronto Symphony. It has been 35 years since they visited these shores. They are disciplined and their sound is almost divine. Like the wine of Scotland, their playing has matured to near perfection. A blend, rather than a malt. Opening on the evening of March 14 with Borodin’s overture to his opera Prince Igor, one appreciated the intensity of the RSNO’s playing. Borodin outlined the score on piano, but died in 1887 before he could orchestrate it. The slow somber introduction gives way to a series of fanfares, suggesting a call to arms. The Polovtsian tribes were about to invade Mother Russia. Dances and sweet oriental themes are introduced by the clarinet. A French horn melody suggests Prince Igor himself and as the piece develops, one is aware of the singing strings, and the lovely tonal balance of this fine orchestra. 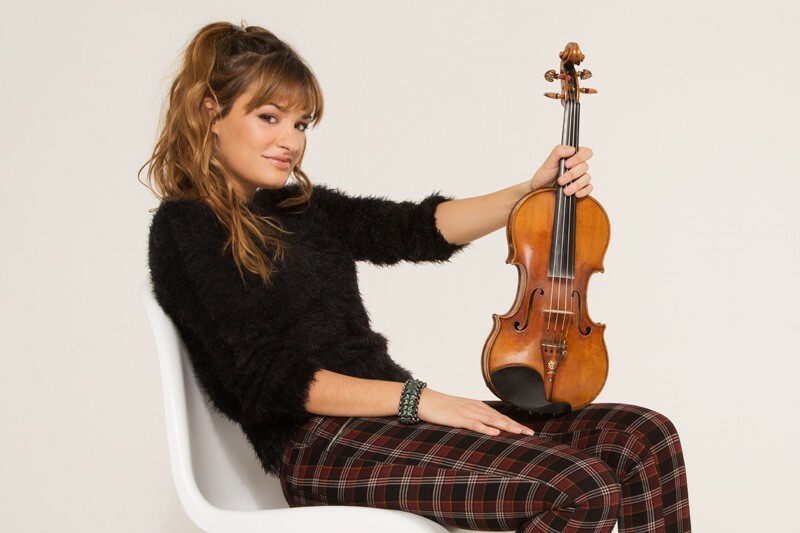 The tall, slim figure of Nicola Benedetti entered, her strawberry blond curly hair, so eye-catching and attractive, flowing down to her waist. Oundjian brought down his baton for the Brahms Violin Concerto (in D major, Op. 77). Standing, Benedetti nodded her head in time with the music during the orchestra’s long introduction, smoothed her right hand down the side of her dress, drew the 1717 Gariel Stradivarius violin under her chin and proceeded to demonstrate her brilliant technique. The main theme of the first movement is announced by violas, cellos, bassoons and horns. This and three other contrasting song-like tunes make up most of the material. With symphonic skill Brahms unleashes his two unequal forces: Benedetti’s lovely, sensitive playing of the romantic parts, and the robust expansive sounding orchestra’s emotional development. They intertwine beautifully, her scale jumping and impossible leaps are breathtaking. The long solo cadenza was brilliantly accomplished, and as the serene main theme returns in the final coda her playing was sensitive and spellbinding. The second movement opens with a dreamy oboe against a background of the other woodwinds.Adding to this tone the soloist plays arabesques and filigrees with captivating beauty. Benedetti’s heavenly playing soared high above the orchestra. The last movement has many hazards for the soloist: double stopping, arpeggiated figurations, precarious passagework, spirited fascinating gypsy-like music, all of which the soloist tackled head-on. Slowing down to its conclusion, the massively huge orchestrations over, the violinist has the last “word.” Her solid interpretation won an immediate standing ovation, and she had four return bows. Tchaikovsky’s Fourth Symphony (in F minor, Op. 36) closed the program. Oundjian brought out the light and shade in the music, making the contrasts sharp and edgy with the brass section sounding brilliant, not vulgar. His brisk stick work in the transition to the finale signaled a command to his players to stay fresh in the last movement. And they responded by playing like demons. It was a magnificent performance overall, but they gave of their best here. As the last notes were heard, the audience, to a person, rose to their feet applauding wildly for such a magnificent night of music-making.